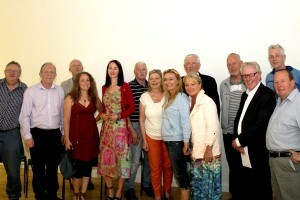 The early evening of Tuesday 24th of June saw a meeting take place at the Clanna Gael Fontenoy GAA Club, Ringsend. A range of community leaders and workers were in attendance. The occasion was a visit by Jackie Redpath, Chief Executive of the Greater Shankill Partnership, Belfast. Despite the impressive and official sounding title, Jackie Redpath is a frontline community activist with over thirty years’ experience. A native of the Shankill area, Jackie lived through some of the most devastating years in the history of his community, including the darkest years of the Troubles. Given the troubled times that local communities are enduring at present, the search is on to find ideas to promote greater co-operation and mutual empowerment in times when money and resources are stretched thin, or entirely absent. The talk concerned the Shankill Community Convention, a forum for concerned citizens which Jackie has been a part of since its inception. One of the main themes of the presentation was summed up by a slide which read “If you don’t have a plan of your own, you’ll become part of someone else’s plan”. 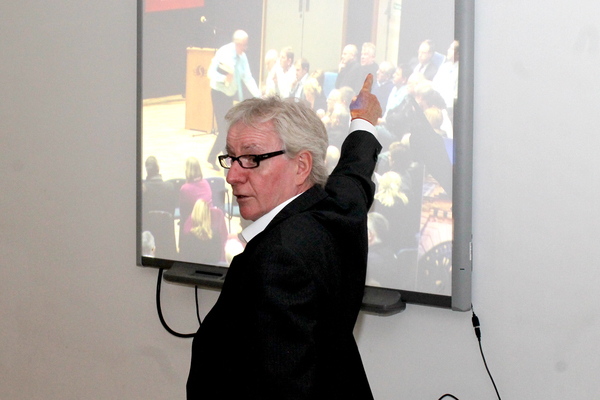 Jackie gave a brief history of the Shankill area, situated between North and West Belfast, inviting those in attendance to draw parallels between his experience and the current situation in Ringsend and Irishtown. Shankill was also an industry-driven community which suffered from the loss of traditional sources of work, resulting in rising poverty and unemployment. This occurred independently of -but inter-relatedly with- the civic unrest and sectarian violence of the 1960s and 1970s when “Shankill took its big, big hit”. The resultant community decay was what Jackie characterised as a “Perfect Storm” of bad influences: Economic hard times, the Troubles, enforced redevelopment plans and the general civil unrest of the period. The presentation had a refreshing directness in its attitude to community problems. The talk emphasised the importance of long term thinking, stabilising local support in the face of community impatience, and great persistence in developing regeneration strategies. One notable inclusion was a diagram called the Development Wheel, which portrayed the life of an individual child, starting at the centre and spiralling out as the child grew, presenting the transition for the family being the main influence on a life, to “the street” and the larger community. “We realised that problems that had developed over 30 years couldn’t be solved overnight, and that regeneration couldn’t come just from inside the community,” he said. An introduction to the Our Town Community Convention for Ringsend and Irishtown will take place on Thursday July 3rd in the Ringsend and Irishtown Community Centre at 7.30pm. As a follow on from the previous steps in the Our Town Ringsend & Irishtown Initiative -consultation evenings, weekend workshops and Our Town Fun Run- the Convention will discuss further the priority topics that emerged and aim to collectively agree a roadmap and timescale for advancing the initiative. The Our Town Community Convention is open to everyone with an interest in the regeneration of the community and all are invited to attend.